I have this book in hardback and absolutely love it. Such a shame it’s currently out of print. I read it first as an adult and just know nieces and nephew will love it. I cannot wait to read it to them. 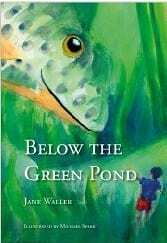 The book is full of not only adventure, but learning about the many friendly and not so friendly pond creatures. Wish I’d has this book as a child. Lovely. Fantastic it’s now on Ebook so people can read it again.